My thoughts and feelings about electronics have evolved over time; just like the technology we use to make music. At first, I didn’t have a practical need for any kind of electronics. I certainly enjoyed them, but didn’t have a gig that specifically required it. So, I more or less didn’t think/worry about it. Then, as is often the case, things change. I began to see a need for some kind of electronics rig that would allow for playing samples, loops, etc. The idea being (and I certainly agree with this) ‘it looks better when you hit a pad that people can see… than a key or button that people can’t.’ This may seem like a small point, but since we ‘hear’ so often with our eyes as well as our ears it does make sense that to see something be struck and hear a sound goes a lot farther than hearing a mass of sound but seeing nothing but someone staring at a computer screen. I was also starting to get calls where the composer/producer/artist just wanted MIDI information. They wanted my performance, but they were going to put their own sounds in. I realized that I could cover a couple of bases with electronics – I could have the live rig, but could also promote myself to those that wouldn’t have had a need for live drums necessarily, but would have a need for a real drummer to give a certain feel and movement to their music. 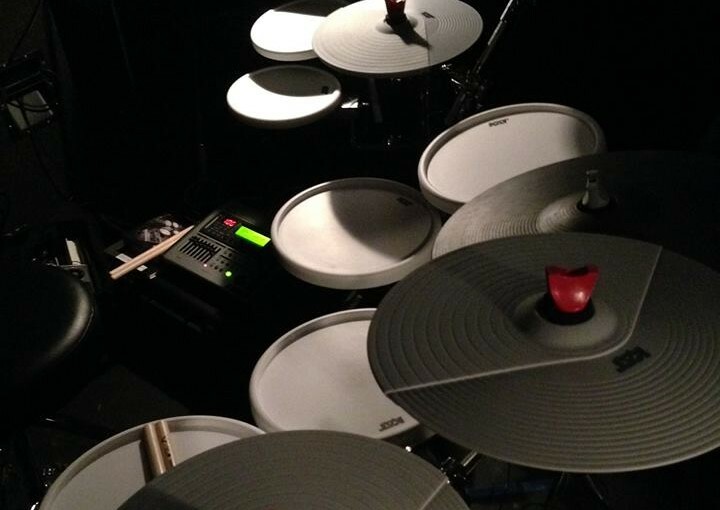 It’s a standard acoustic kit with a multi-pad unit (sometimes there’s a trigger on the bass drum and on a side snare – not seen in the photo). 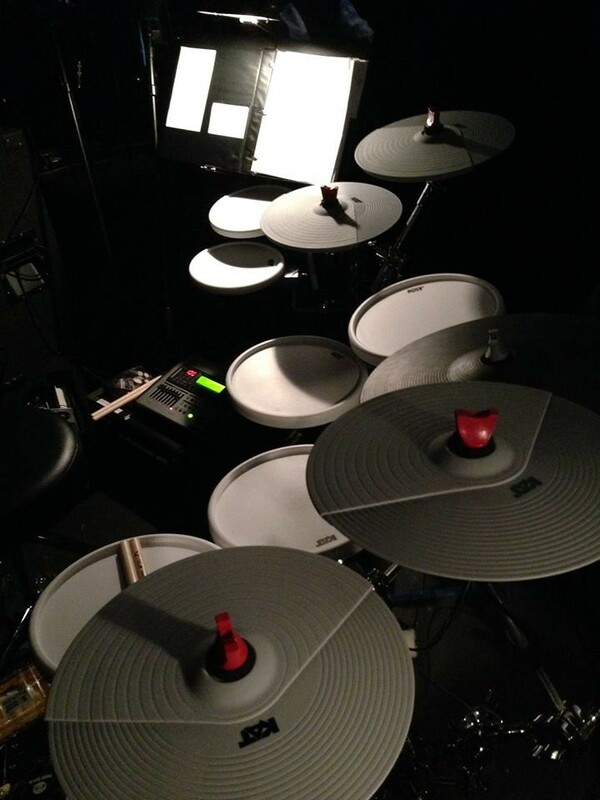 I use a set up like this for The Jacob Szekely Trio, Kari Kimmel, and The Rigs. I have access to sounds we create/use in the studio without having to cart a lot of extra stuff around or adding additional players on stage. The multi-pad unit is one of the easiest ways to get into electronic drums and there are a several different options available to you. While I won’t go through all options here, I will list a few that I have used and enjoy. Yamaha’s offering to the multi-pad world is the DTX-12. It has (you guessed it) twelve pad surfaces all sloping gently downward so you can hit them all easily. You can also add up to 5 additional triggers/pads (including a dedicated hi-hat pedal). Loaded with over 1200 sounds and a variety of internal effects, this unit also allows you to connect via USB to access additional sounds. Yamaha recently released a very convenient iPad app so you can create and customize kits on the fly as well as access your sounds easily. A feature like that is super convenient when you make changes to a set list last minute back stage or you need to load a new sound for the show. The DTX-12 shows up on most music sites for $599.99. It’s a great unit and very comfortable to play. It comes with 64 MB of flash ROM for loading custom sounds. While it may seem like a very small amount of ROM, you have to remember you can access sounds via USB and control all of that through the downloadable app for iPad. Roland’s second generation multi-pad offering (an update/upgrade of their first generation SPD-S) has 9 playing surfaces. You can plug in up to 4 additional triggers/pads (using a stereo y-cord to split out your signals). You have 2 GB of internal memory in this unit (translates to 360 minutes of audio as 44.1k .wav or .aiff files) and 21 on-board effects. Sounds and kits its are added/created by way of a wave manager that you download. You connect the unit via USB and from there you can add sounds and create kits. This unit shows up on most music sites for $799.99. I have used the SPD-SX quite a lot. It feels good to play and the 2 gigs of internal memory makes it easy to have a lot of sounds at your finger tips. Having to connect to the wave manager to edit patches and create new ones means you need your lap top with you (but then again, most of us usually do anyway). This also means that if set lists change, or new songs get added and you don’t have those sounds already loaded, then you need to spend some screen time loading sounds and creating kits. While it becomes second nature to do, it does take some time to understand and get used to. Nord’s foray into the e-drum world takes the shape of the Drum 2. The big brother of the Nord Drum, this unit is very different from the other two mentioned. This is a modeling percussion synthesizer. What the hell is that? Well, this doesn’t have ‘samples’ per se. You have tone generators that offer a palette of sounds that you can then manipulate to create classic synthetic sounding drums (a la Simmons, Synare, or Syndrum) or realistic sounding drum and tuned percussion sounds (gamelan, vibes, marimba, etc.). The editing capabilities of this unit are pretty extensive and, to be honest, I was a little intimidated to start. But, after a while I began to get a handle on it. You can plug up to 6 triggers/pads to the back of this unit. It also has MIDI In/Out/Thru – allowing you to access other sounds from drum machines, synthesizers, etc. Also available is the Nord Pad (a 6 pad trigger unit – a separate purchase) via a CAT 6 cable and the unit maps directly to the Nord drum. In this capacity you can also plug in a kick drum trigger (so you, essentially, have 7 trigger sources). It offers the distinct engineering and color scheme that the Nord brand is famous for and is truly a tool for those that really like to tweak their sounds in real time. This is a great unit if you want to create your own sounds on the fly and are looking for a more hands on experience within a performance. The Nord Drum 2 lists for $599.99 and the Nord Pad lists for an additional $399.99. A ‘hybrid’ kit is only half of the picture though. The flip side is the full ‘e-kit’. I’m not talking about rinky-dink $300 kits that offer little functionality and horrible feeling pads. I’m talking about a well designed and tested e-kit that has a large library of sounds and advance functionality. Out of all of the options we considered, an ‘e-kit’ seemed to make the most sense. It would keep the band on stage and integral. It would cut down on sound drastically. It would look cool. It would not require a plexi-glass shield fishbowl. It would not compromise the overall sound of the show for the singers or the audience. I need a decent set of sounds I can use alone and in conjunction with sample libraries, MIDI, etc. I also added a limit for myself as I researched options. I would stick with Yamaha or Roland. There are plenty of companies out there now offering a variety of products but, for me, the histories that both of these companies have with electronic drums and my comfort level with both made them the clear favorites. I would only search elsewhere if I could not find what I needed within either of those two companies. In the end, this is what I wound up getting. I settled on an upgraded Roland TD-20. At the time, I did not find a Yamaha brain of comparable power (the DTX 900 series) so I went with what was there. I had very little time to get this whole rig worked out so I needed act quick. I also had a lot of practical experience with the Roland units. The sounds are very usable and since I would also be using additional external sounds, I knew I would be able to get what I needed from the unit. I could plug in up to 15 pads and the unit has 8 separate outputs so the FOH could have the control they needed. Since that purchase I’ve gained a fair bit of experience on the Yamaha stuff, and recently played the new DTX 900 kit at the Yamaha facilities in Buena Park. It was great to explore the product line while I was down there and I hope to be able to share more good news on that front in future postings! Additional sounds would come from the venerable Toontrack. They are the company that makes the famous Superior Drummer 2.0 and EZ Drummer. With these libraries, you have drums recorded at some of the best studios in the world by some of the best engineers in the world. Rikk Currence and the crew hooked me up with a plethora of libraries that I’m using to create my own custom patches for all of the Vox Lumiere shows. Using VST (virtual sound instrument sets) libraries greatly expands your available options as keyboardists, drummers, percussionists, and producers alike. This is truly one of the beauties of using electronics as a drummer/percussionist: expanded sound options. As I’m not a fan of mesh head pads so, I needed a different option. 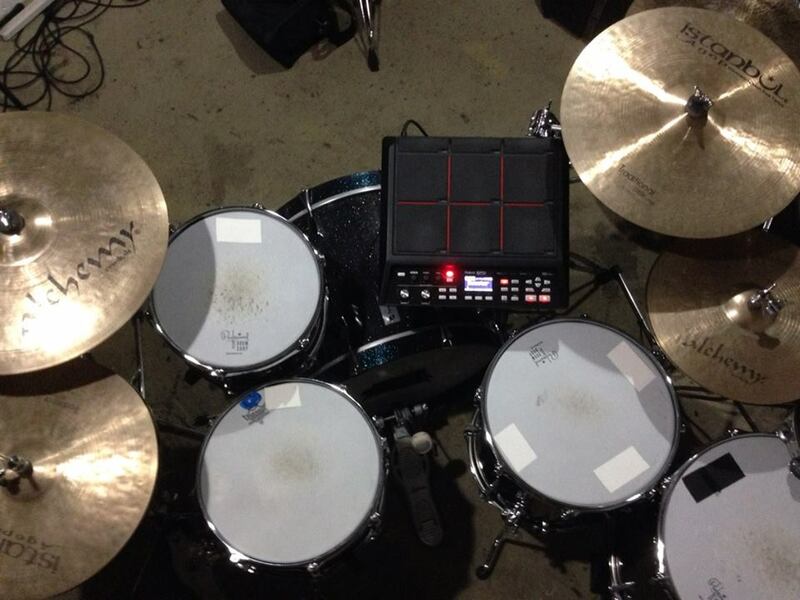 Thanks to the guys at Pro Drum I was able to get into the KAT pads (see below) for a very reasonable price. The pads feel great to play on (like a really nice practice pad). I didn’t have to adjust my technique very much at all. They were also interesting to me because they were white. We could consider visual options for the show – bouncing lights off of the pads or spotlighting them to cool effect. I set myself up for success. With great feeling pads all I had to do was get my angles identical to my regular acoustic kit and I was good to go; just with a smaller footprint. I was able to play just as relaxed as I always do with nothing more than sound level of a practice pad as far as stage volume goes. I also switched to maple sticks instead of hickory to further lighten my touch. I was pleased. Since purchasing the KAT pads I have spent some quality time with the Yamaha DTX pads. I fell in love with the pads immediately. The textured cellular silicone (TCS) surfaces are amazing and with the 900 series pads there is a small knob on each pad you can use to change the tuning of the sound or, in the case of the snare drum – snare tension. A very interesting and useful feature that allows for a certain amount of tweaking of your sound on the fly – just like with a drum key on a regular acoustic kit! Very slick. Here is the v.1 e-kit. It worked to wonderful results on a series of performances of Phantom of the Opera we did last year with Vox. The net result of this budget conscious foray into electronics (both the multi-pad unit and the full e-kit) was an investment that meets the needs/vision of a variety of my gigs. I have easily made back what I spent on this gear since purchasing it and then some. There are added benefits besides. With Vox Lumiere we cut our sound check from over 2 hours for band and vocals to about 40 minutes. Because of the decreased decibels coming off stage; you save singers voices, create a level of consistency for your sound, and you save time. A lot of time. We also have access to sounds that we might not be able to afford if we were using the real thing. Budgets are an important part of any artistic endeavor and when you are touring a show like Vox, you may be playing places where you don’t have access to a 36″ gong or a 40″ bass drum. Shipping the real deal would be ruinously expensive. So, we have the next best thing. The e-drums also look cool and fit in with the whole aesthetic of the show. It is a conversation starter. For people coming to see the show for the first time – they are amazed at how we’ve been able to use electronic drums and not make them seem hokey or gimmicky. I’d like to think (in our own small way), we are helping to legitimize an electronic alternative within the theater world. It’s far better than putting a musician out of work and just running tracks! For us, it’s a win/win. For the groups I use a multi-pad or hybrid kit for, I have access to critical sounds and cues that make the songs come alive on stage – all in a convenient package about the size of a rack tom. We also look like we are playing (because we ARE!) instead of pressing buttons and trying to look busy in between. In the end, not a bad way to invest in your craft, huh? How is the SPD-SX mounted in the second picture.